You see, I had no idea she was in Vancouver. Red numbered positions on the map indicate almost all the locations of exterior shots seen in Point of View. Omissions are the locations where: Jane photocopies her pictures of Frank in chapter 3; Frank speaks to the audience in his chapter 4 Encounter; and Peter makes his first telephone call to Jane in chapter 5. For information about these locations, please consult my 2002 interview with PoV director David Wheeler as I could not identify them at the time of my trip to Vancouver in late 2001. The precise locations of interior only scenes, namely those that take place at: the New York photographer's studio; Jane and Mary's workplace; the police station; Mary's home; Mr. Barnes' home; and Peter's home may be found only within my 2002 interview with PoV director David Wheeler as I could not identify them at the time of my trip to Vancouver in late 2001. If PoV was reality rather than fiction, it would be logical to assume that the relevant police station would be the one situated at the corner of Main and Cordova Streets. Landmarks often seen in the distance, such as the "saucer" topped Harbour Centre, are the main reason for the existence of the left side of the map. 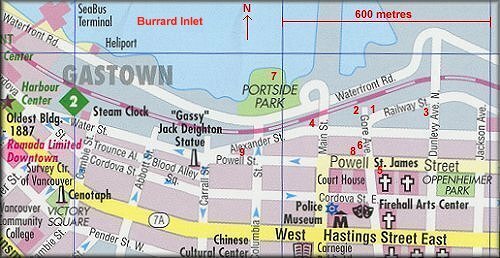 That side also places the PoV exterior locations in their geographical context of Vancouver's Gastown and Downtown East Side districts. Stanley Park (mentioned in one of Mary's chapter 3 diary entries) is located almost two kilometres to the north west of the top left hand corner of this map. Federico's Supper Club (site of the wrap party seen in the PoV DVD's "making of" special) is located over a kilometre to the south east of the bottom right hand corner of this map. For detailed pictorial and textual information, please consult the subsections under the Locations heading. They are presented in the order in which they appear in the movie with the exception of the Special subsection. Some Locations pages include screenshots and/or quotes from the movie to assist the visitor in making connections between fantasy and reality. Quotes need not match the dialogue that actually takes place at the point where the screenshot was taken, but they are always at least thematically compatible.